After the excesses of last week’s ingredient-fest that is gado-gado, we are down to earth. Quite literally. You can’t more down to earth than beetroot, can you? Beetroot – or beets as they are shortened in the US – are a fabulous soup vegetable. At once wholesome and visually decadent, these rough orbs reveal ruby beauty with just a light scrub and peeling. Of course they can be all kinds of colours – the fancy orange ones are pretty gorgeous, as is the pink candy cane-striped chioggia variety – but the ‘normal’ purple variety is just fine by me. I used to not be a fan of this love-it-or-hate-it vegetable. That’s probably an understatement: they were the devil’s food. Nasty, sour-tasting balls of dirt contaminating many a school salad (which would’ve already been beyond horrible). But once I discovered that beets didn’t HAVE to be kept imprisoned in dusty jars of sharp vinegar, that they could be used raw or cooked like NORMAL vegetables, well I now eat them all the time. And I now DO like them marinated in vinegar, but really only like in the recipe I am sharing today. Fruity, spicy, aromatic. So today, a simple and easy soup recipe to (hopefully) convert any beetroot abstainers among you, as well as a bonus pickled beetroot recipe that can be put together with any good quality fruit vinegar. The latter is superb with many warm (or cold) salads, with warm grains, to liven up sandwiches and wraps, and with blinis, creme fraiche and smoked salmon. Loads of other potential uses too. I’ve been thinking that they might be quite fun in my Beetroot and Cashew Hummus recipe, using half roasted and half marinated beetroot. They would certainly be at home as they are on a mezze platter. If you are interested in knowing more about what beetroot offers nutritionally, please click on my recipe for Beetroot Zinger Juice – the food to glow secret weapon against colds (along with Spiced Golden Turmeric Milk). I’ve got quite a lot of beetroot recipes so just check the Index (above) if you want more ideas for this much-maligned vegetable. Are you a beetroot fan or phobe? What’s your worst or best memory of beetroot as a child? Any beetroot recipes or growing tips to share? Look – no fat! This soup is unfeasibly red and tasty, and sublimely easy to make too. Drop the wasabi if you don’t have it, but if you do, please use it as it adds a certain something without actually being hot. Add some crumbled soft goats’ cheese or Greek yogurt when serving, if you like. And more wasabi, after tasting first. Bring the stock to the boil then add the remaining ingredients except the wasabi and optional lime and crème fraiche/yogurt. Simmer for 25 minutes, or until the vegetables are tender. Blend thoroughly then add the lime juice, wasabi and the crème fraiche or yogurt, if using. Snipped fresh chives make a beautiful garnish. If you are trying to keep weight on go ahead and sauté the vegetables in some olive oil but otherwise this is great fat-free soup. Like this? Want another beetroot soup idea? 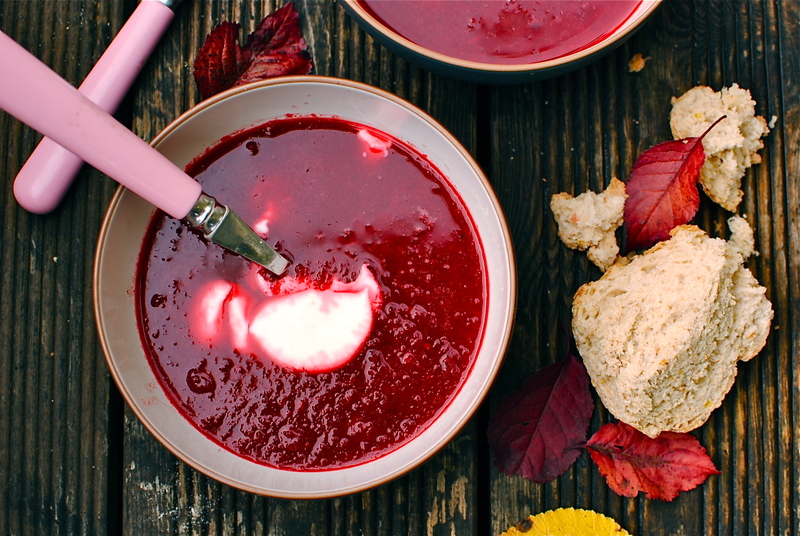 How about Sweetly Savoury Borscht (it’s vegan)? Rub the beets with a little oil and wrap in a large foil packet (or as individuals); place on a baking tray and bake in a 180C/350F oven for one hour, or until the beets are easily pierced with a sharp knife. Allow to cool a bit then slip off the skins using a small paring knife – it should be pretty easy – then cut into chunks that will fit in the jars you have. Pop the chopped beets into sterilised jars. While the beets are cooling enough to peel, pour the vinegar, water and sugar in a non-reactive saucepan and bring to the boil. Let boil for five minutes then pour carefully into the beetroot jars and divide the cardamom, chillies and coriander seeds between the jars; seal. The beets are ready to eat in a few hours but taste better the longer you leave them. The unopened jars will keep for a couple of months. Once opened use within seven days. I’m a beetroot fan, always have been. I love the stuff. 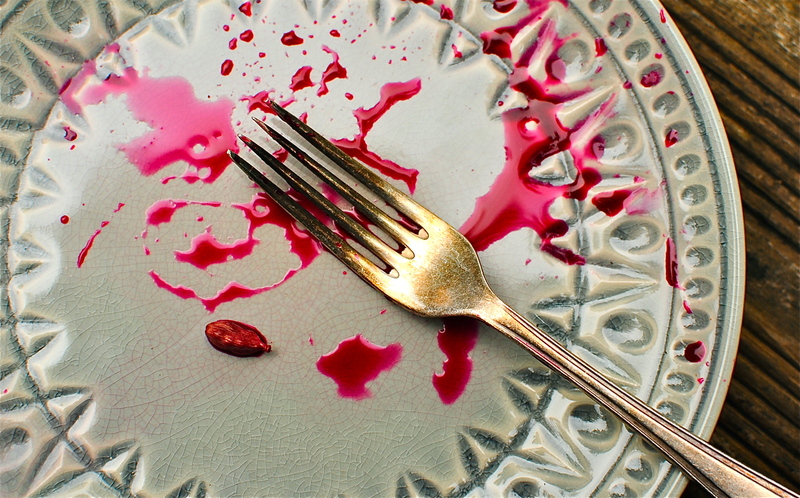 Best memory of beetroot was being at my aunt’s house one summer and my father accidentally dropping a whole jar of home-pickled beetroot all over her good (white) lace tablecloth. For once it wasn’t me in trouble at the dinner table! My rather strict Uncle’s face was an absolute picture. I will try it over Christmas. Just a bit of a stupid question but I don’t have a blender, would mashing it down do a similar job or would that ruin it? No electric choppy things in this flat but I keep thinking I ought to get a hand blender so the time is right! I remember thinking I needed to see the doctor when went to the bathroom after eating beetroot-just a ‘wee’ warning! I’ve written a number of beetroot recipes and have given that warning before, but perhaps I need to put it in every time. Anyone reading this, consider yourself warned! I bet you have heard of borscht so this is just another way with beets as soup. A simpler one 😀 But plain roasted is always a winner. They taste nice as a soup just whizzed up with some white beans and thyme too. I didn’t know about borscht either. Just looked it up… much to learn… much to learn. 🙂 thank you! Ah, I shouldn’t make assumptions. There is lots I don’t know. That’s what’s so good about food blogs – loads of information, inspiration and constant hunger pangs! I love the red of the beets. This is just like borscht! So delicious and healthy too! 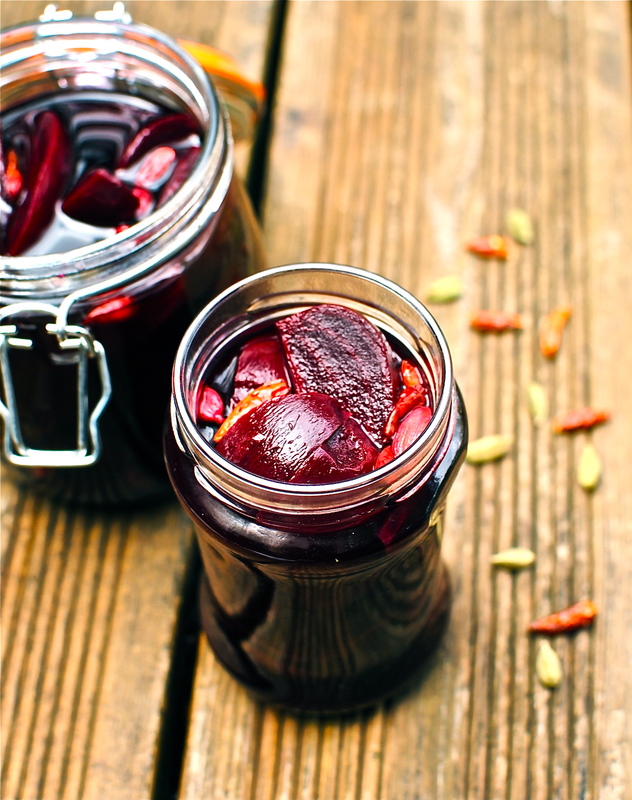 I love beets, so I will definitely try this recipe!!!! Kellie, your photos for this post are exquisite…..I adore the way you shot the soup sitting on a seasonal bed of leaves! A visual treat, and then some great recipies. We pick beetroot straight from the garden and bake it with a little sugar and balsamic vinegar…..it’s amazing and very addictive! I remember the first time I fed my son beetroot…he was still in nappies and I’m sure you can imagine my panic….. I could just grab a spoon and tuck in! Beautiful recipe, Kellie! This looks lovely. I need no convincing with beets, fortunately. My grandmother always pickled her own beets when I was growing up, so that was a great first beet experience for a child who loved any sweet-tangy combo. 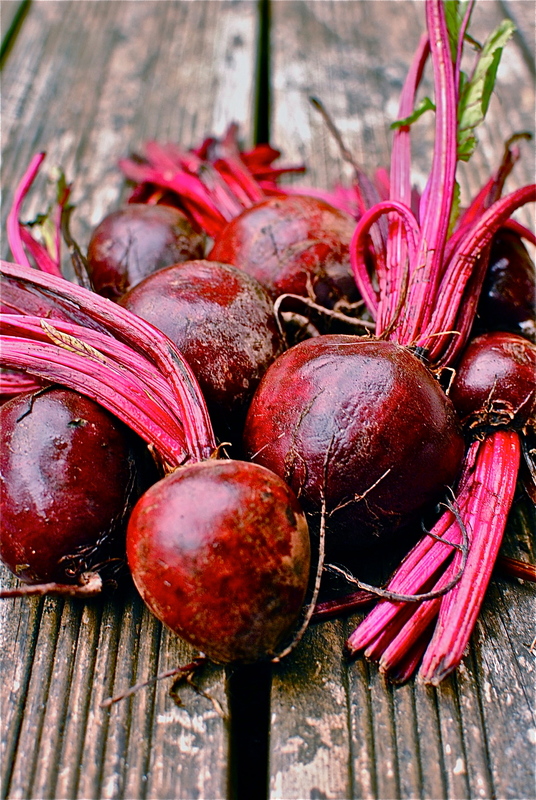 Now I generally lean towards roasting beats for grains, juicing (love your Beet Zinger Juice! ), or thinly slicing raw for salads. So I must try this soup! Thanks Kellie! Fantastic, loaded both on colour and vitamins!! This sounds amazing! Thanks for sharing, I will be trying this for sure. wonderful colours and such an inspired flavour combination. I think the idea of lifting the earthiness of beetroot with wasabi and lime is just so clever. You know for my first dinner party (when I was 15) I made borscht soup as a starter. 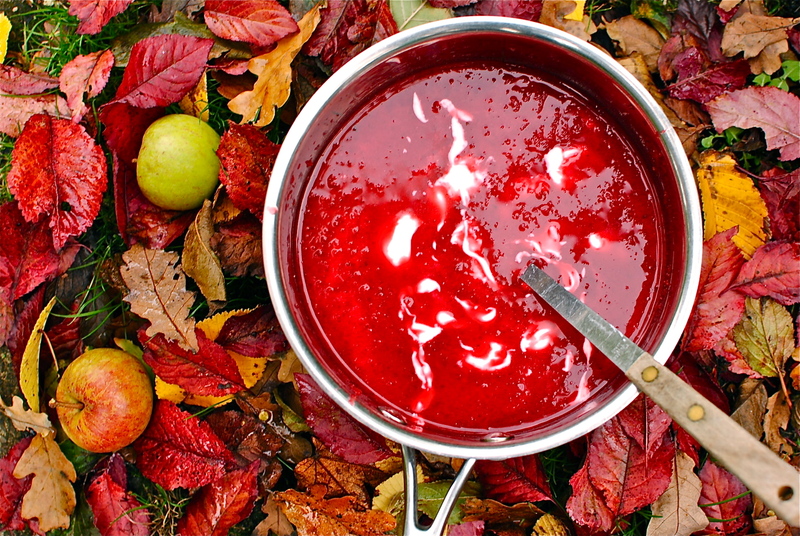 Love that colour and this is a wonderful reminder that I need to make a beetroot soup again. 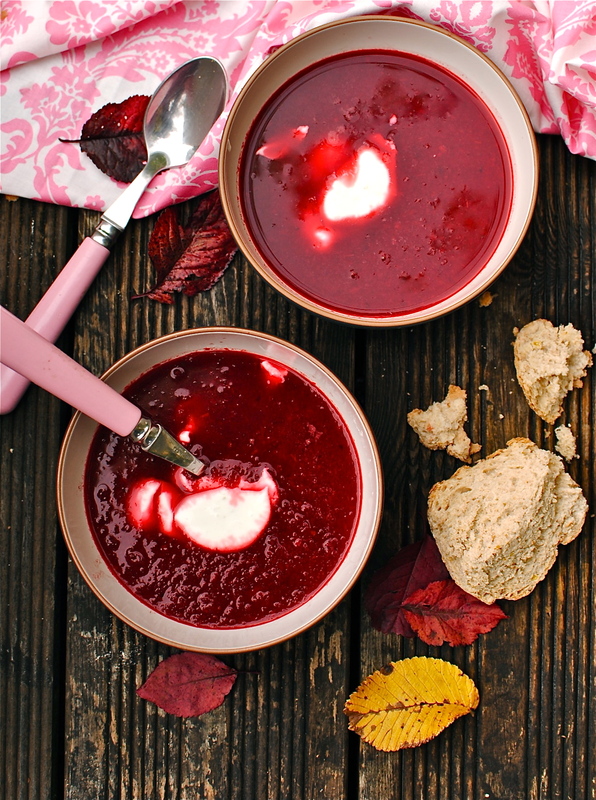 ooh, yes, this is the soup for me… I adore beetroot and just look at that colour! So autumnal which is wrong because it’s not even September yet even though the weather thinks its October! Ha ha! It is funny that actually here in Edinburgh it has been the summer we should have had in July. It’s been gloriously sunny. A real treat. Still, the beets around just know are just perfect for the soup. Which is actually quite nice (because of the wasabi) cold. Thanks for stopping by this old post!